Last month, RD-Connect has successfully published a paper “Recommendations for Improving the Quality of Rare Disease Registries” available in the International Journal of Environmental Research and Public Health. The article provides a list of recommendations, developed by a group of experts, including members of patient organisations, to be used as a framework for improving the quality of rare disease patient registries. This list includes aspects of governance, Findable, Accessible, Interoperable and Reusable (FAIR) data and information, infrastructure, documentation, training, and quality audit. The list is intended to be used by established as well as new rare disease registries. Further work includes the development of a toolkit to enable continuous assessment and improvement of their organisational and data quality. 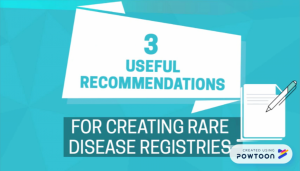 Recognising the importance of this publication, EURORDIS has summarised the key recommendations in their new video “Recommendations to create Rare Disease Registries” available here. We recommend watching the video and reading the publication to anyone involved the rare disease field, particularly those interested in setting up a new rare disease patient registry.